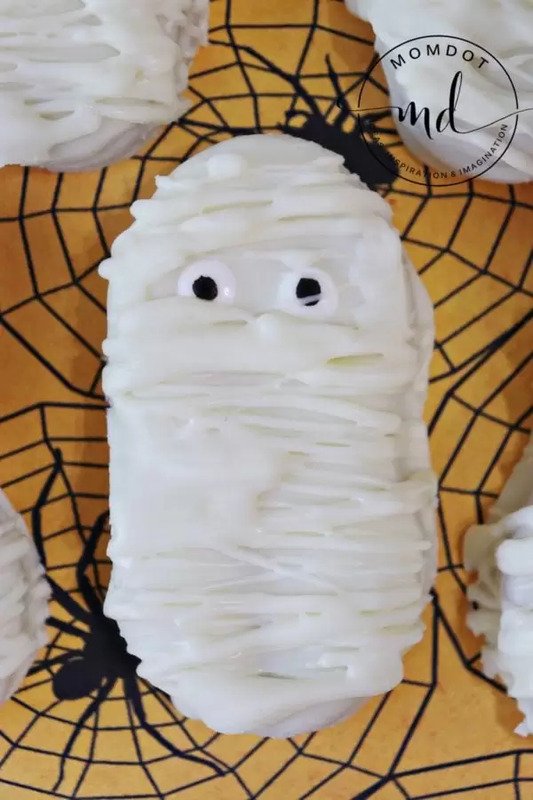 Home » Crafting » Nutter Butter Mummies – Frightfully Easy To Make! 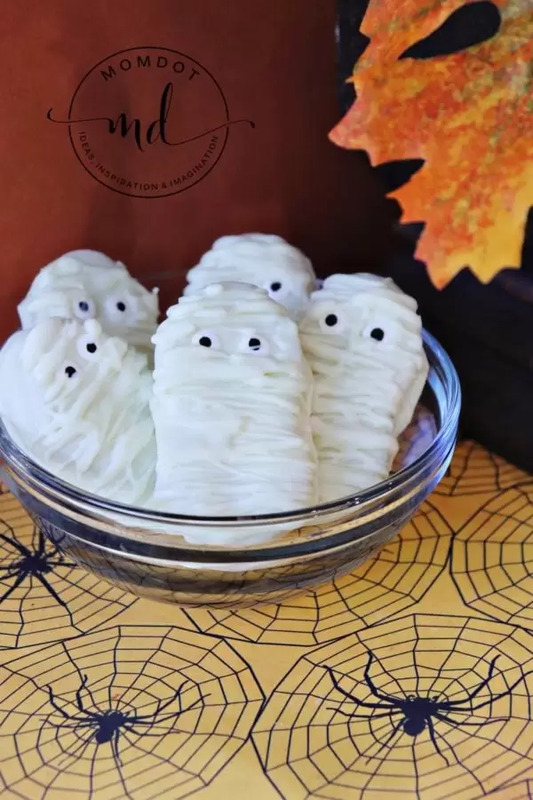 Grab a few items from your pantry, use the tools you have on hand, follow this simple recipe, and you’ll be making adorable mummies in minutes! You’ll love how frightfully easy they are! Alright, I’ll just admit it right now: I’m a scaredy-cat. Always have been and probably always will be. Even though I love fall and all things that go with it, including Halloween, I hate being scared. Growing up ghosts terrified me, zombies were disgusting, and knowing how to rid myself of vampires seemed like a legit piece of information I would truly need to use one day. But for some reason mummies were different. My heart always went out to mummies. To me, those poor souls weren’t scary. Looking at it through my childlike eyes, all that moaning and groaning was just a plea for help to get the darn wrappings off that they’d been trapped in for thousands of years! And no one would take the time to stop and help them. Looking at it now, I’m thankful I never encountered a real mummy, as I’m sure I wouldn’t have liked what was underneath those wrappings. 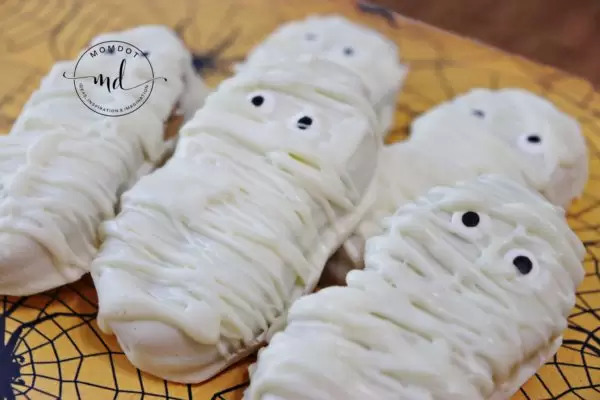 The great thing with these Nutter Butter Mummies is you know exactly what’s under the delicious white chocolate – a delectable peanut butter cookie kissing a creamy peanut butter filling. What a great combination! 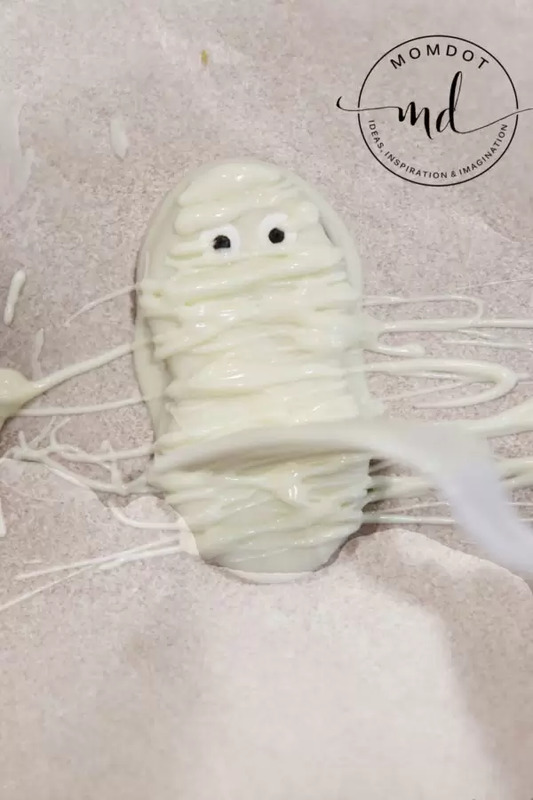 As I mentioned with the Ghoulish Ghosts, one of my favorite things about making these Nutter Butter Mummies is the fact that they don’t need to look perfect to get the idea across. In fact the less uniform the better. You and your kids will have a great time making them together without the pressure of trying to get them to look exactly the same. Let’s get started! First, lay out sheets of wax paper on a cookie sheet or countertop. Have your packages of Nutter Butters and candy eyes open and ready to use. Second, pour the white melting wafers into the top pot of a double boiler. If you don’t have a double boiler, a bowl and a microwave will do the trick. Helpful hint: You want to melt the wafers slowly, over very low heat, to help it stay at its smoothest consistency. It’s also incredibly important to not get ANY moisture in the pot/bowl with your wafers. As soon as the wafers are completely melted and smooth remove the pot from the heat. You’re now ready to start dipping your Nutter Butters. 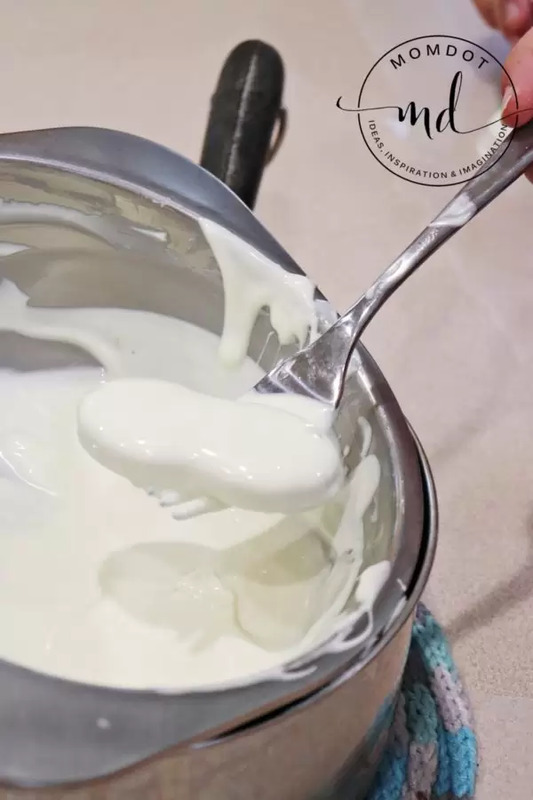 Start by placing a Nutter Butter in the melted white chocolate and move around with a fork to cover completely. Then use the fork to lift the Nutter Butter out. Tap the fork against the side of the pot once or twice to get off the excess chocolate. Then slide your white–covered Nutter Butter onto the wax paper. Next, quickly place two of the candy eyes on top of the still warm chocolate. Continue with the rest of the Nutter Butters. Helpful hint: Most importantly, let the mummies cool and harden completely before drizzling. If you try to start making the wrappings too soon the lines will just blend in with the rest of the white chocolate. 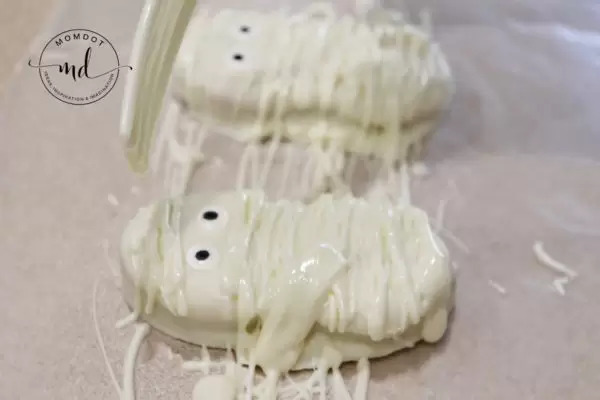 You can also pour the white chocolate into a small sandwich bag, snip the tip, and drizzle it that way, which is what we did for our Lunch Lady Peanut Butter Fingers. But I found a fork to be perfectly sufficient for this. Less steps and easier clean up! That’s scary awesome! Helpful hint: Do not remove the mummies from the wax paper until they have hardened. If you remove them too soon most of the white will remain stuck to the wax paper. If you wait patiently for them to dry they will easily leave the paper with no residue left behind! Finally, after removing the mummies from the wax paper, you may need to trim the edges just a bit (depending on how much fun you had drizzling the wrappings on top). And that’s it! Check out those cute mummies you just made. I bet you can’t find a scary one in the bunch!